Mulching of soil beds of strawberry fields is usually done with polyethylene film in southern Minas Gerais state, Brazil. This material is relatively expensive and difficult to discard after use. In some countries, mulching is done with the use of organic material that could have an advantage over the use of plastic for its easier degradation after use, and for favoring edaphic beneficial organisms. Predatory mites (especially Gamasina, Mesostigmata) may be abundant in the soil and could conceivably move to the soil surface and onto the short-growing strawberry plants at night, helping in the control or pest arthropods. The two-spotted spider mite, Tetranychus urticae Koch, is considered an important strawberry pest in that region, where the fungus Neozygites floridana (Weiser and Muma) has been found to infect it. Different mulching types could affect the incidence of this pathogen. Dehydrated coffee husk and pulp (DCHP) is a byproduct readily available in southern Minas Gerais, where could be used as organic mulching in strawberry beds. The temporary contact of that material with the soil of a patch of natural vegetation could facilitate its colonization by edaphic predatory mites helpful in the control of strawberry pests. 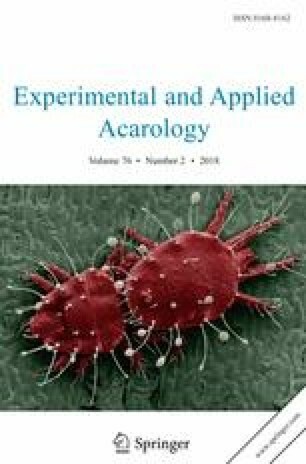 The objective of this work was to study the effect of mulching type on the population dynamics of the two-spotted spider mite, associate mites and N. floridana, in a greenhouse and in the field. The use of DCHP increased the number of edaphic Gamasina on strawberry plants—Proctolaelaps pygmaeus (Müller) (Melicharidae) and Blattisocius dentriticus (Berlese) (Blattisociidae) were observed on strawberry leaflets, mainly in nocturnal samplings, indicating their possible daily migration from soil to plants. Lower levels of two-spotted spider mite occurred on plants from pots or soil beds mulched with DCHP instead of polyethylene film, possibly because of the slightly higher levels of mites of the family Phytoseiidae and infection by N. floridana. Adding DCHP onto the floor of natural vegetation did not result in higher diversity or levels of gamasine mites on DCHP. Complementary studies should be conducted to find ways to increase diversity and density of those organisms in strawberry beds, in an attempt to improve biological control of strawberry pests. The decision to use DCHP for mulching should also take into account other factors such as strawberry yield, costs and efficiency of weed management, to be evaluated in subsequent studies. We are grateful to Camila do N. Dainese and Jairo Freitas for their assistance in the conduction of this work. This study was funded by CAPES (Coordenação de Aperfeiçoamento de Pessoal de Nível Superior Brasil—Finance Code 001) and The Research Council of Norway through the SMARTCROP project (Project Number 244526).